Teoh JS*, Soh MS*, Byrne JJ*, Neumann B (2019). Quantitative approaches for studying cellular structures and organelle morphology in C. elegans​. Journal of Visualized Experiments Accepted 18th April, 2019. Brief summary. Soh MS, Cheng X, Liu J, Neumann B (2019). Disruption of genes associated with Charcot-Marie-Tooth type 2 lead to common behavioural, cellular and molecular defects in Caenorhabditis elegans. bioRxiv 605584; doi: https://doi.org/10.1101/605584. Brief summary. Byrne JJ, Soh MS*, Chandhok G*, Vijayaraghavan T, Teoh JS, Crawford S, Cobham AE, Yapa NMB, Mirth CK, Neumann B (2019). Disruption of mitochondrial dynamics affects behaviour and lifespan in Caenorhabditis elegans. Cellular and Molecular Life Sciences 76:1967–1985. Journal Link. Brief summary. Cover image. Linton C, Riyadh MA, Ho XY, Neumann B, Giordano-Santini R, Hilliard MA (2019). Disruption of RAB-5 increases EFF-1 fusogen availability at the cell surface and promotes the regenerative axonal fusion capacity of the neuron. Journal of Neuroscience 39 (15) 2823-2836. Journal link. Cover image. bioRxiv version. Neumann B*, Linton C, Giordano-Santini R, Hilliard MA (2019). 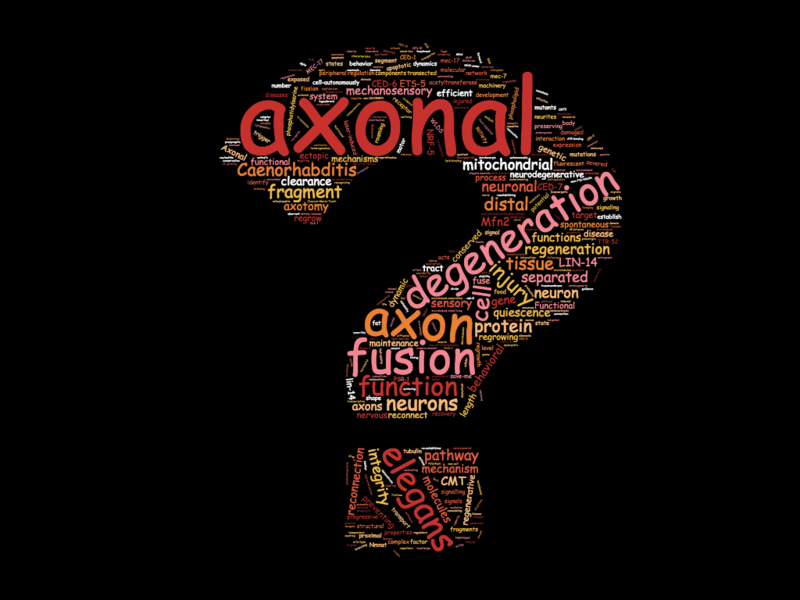 Axonal fusion: an alternative and efficient mechanism of nerve repair. Progress in Neurobiology - Review Feb; 173: 88-101. Journal link. Teoh JS*, Wong MYY*, Vijayaraghavan T*, and Neumann B (2018). Bridging the gap: axonal fusion drives rapid functional recovery of the nervous system. Neural Regeneration Research - Invited Review 13(4): 591-594. Journal link. Chandhok S, Lazarou M, and Neumann B (2018). Structure, Function, and Regulation of Mitofusin-2 in Health and Disease. Biological Reviews - Review 93(2): 933-949. Journal link. Abay ZC, Wong MYY, and Neumann B (2017). daf-2 regeneration of mechanosensory neurons: integration. ​Micropublication: biology https://doi.org/10.17912/W2NW9C. Journal link. Abay ZC, Wong MYY, and Neumann B (2017). daf-2 modulates regeneration of mechanosensory neurons II. Micropublication: biology https://doi.org/10.17912/W2SM1T. Journal link. Abay ZC, Wong MYY, and Neumann B (2017). daf-2 modulates regeneration of mechanosensory neurons I. Micropublication: biology https://doi.org/10.17912/W2XD3R. Journal link. Abay ZC, Wong MYY, Teoh JS, Vijayaraghavan T, Hilliard MA, and Neumann B (2017). Phosphatidylserine ‘save-me’ signals drive functional recovery of severed axons in Caenorhabditis elegans. Proceedings of the National Academy of Sciences 114(47): E10196–E10205. Journal link. Media release. Brief summary. Champagne celebrations! Juozaityte V, Morera DP, Podolska A, Nørgaard S, Neumann B, and Pocock R (2017). The ETS-5 transcription factor regulates activity states in Caenorhabditis elegans by controlling satiety. Proceedings of the National Academy of Sciences 114(9):E1651-E1658. Journal link. Media release. ​Neumann B*, Coakley S, Giordano-Santini R, Abay ZC, Linton C, Seung Lee E, Nakagawa A, Xue D, and Hilliard MA (2016). Molecular characterisation of axonal fusion, a highly efficient means of nervous system repair. Frontiers in Cellular Neuroscience - Conference Abstract: 14th Meeting of the Asian-Pacific Society for Neurochemistry. doi: 10.3389/conf.fncel.2016.36.00073. *Corresponding author. Journal Link. Chandhok S*, and Soh MS* (2016). Presynaptic deficits at neuromuscular junctions: a specific cause and potential target of axonal neuropathy in type 2 Charcot-Marie-Tooth disease. The Journal of Neuroscience - Review 3;36(31):8067-9. *Equal contribution. PubMed link. ​Cover image. ﻿ Faculty of 1000 recommendation. Kirszenblat L, Neumann B, Coakley S, and Hilliard MA (2013). A dominant mutation in mec-7/β-tubulin affects axon development and regeneration in Caenorhabditis elegans neurons. Molecular Biology of the Cell 24(3): 285-296. PubMed link. Cover image. Neumann B, Nguyen KC, Hall DH, Ben-Yakar A, and Hilliard MA (2011). Axonal regeneration proceeds through specific axonal fusion in transected C. elegans neurons. Developmental Dynamics 240(6): 1365-1372. PubMed link. ​Cover image. Editors' Choice highlight in Science. ﻿Highlight in Developmental Dynamics﻿. Neumann B, Zhao L, Murphy K, and Gonda TJ (2008). Subcellular localization of the Schlafen protein family. Biochemical and Biophysical Research Communications 370(1): 62-66. PubMed link. Zhao L, Neumann B, Murphy K, Silke J, and Gonda TJ (2008). Lack of reproducible growth inhibition by Schlafen1 and Schlafen2 in vitro. Blood Cells Molecules and Disease 41(2): 188-193. PubMed link.